The Garry Hocking era at South Adelaide got off to a winning start as the Panthers registered a hard-fought three-point victory over West Adelaide at City Mazda Stadium on Friday night. The Panthers, who unveiled new recruits Abe Davis (Sydney Swans) and Adam Hunter (Mt Compass - GSFL) and celebrated Scott Taylor's 50th game prior to the first bounce, got the better start under lights and led by as much as 28 points in the second quarter before taking a 41 to 25 lead into the main break. However, West Adelaide began to work their way back into the match late in the first half and carried the momentum into the third quarter. The Bloods kicked five goals to one in the penultimate term and took a two-point lead into the final break to set up a nail-biting final quarter. To the Panthers credit, they did not buckle under pressure and were able to take back the lead thanks to two goals from Xavier Gotch and majors to Sam Overall and Nick Liddle. Joel Cross was at his usual brilliant best for the vistors, collecting 27 possession and delivering seven inside 50s. On the end of several of those forward entries was the strong-marking Overall, who was impressive with three goals from 16 touches and eight marks, and Ben Haren (16 disposals, nine marks and two goals). Meanwhile, Gotch also played well through the middle of the ground and up forward, with 19 touches, nine marks and two crucial goals in the final quarter. On debut, Davis was outstanding (26 touches, nine marks and a goal) as he made his presence felt across all three lines, starting in the centre square, drifting forward at times and finishing the game in defence. Three-time Knuckey Cup winner Nick Liddle was also important in registering the victory with 21 disposals and a last-quarter goal. The Panthers now take their season into the country zone with an Easter Sunday (2:10pm, April 16) clash with the Adelaide Football Club in Encounter Bay. 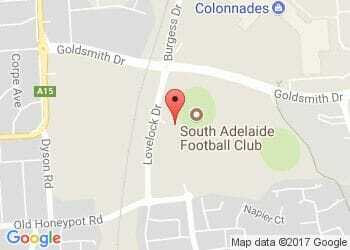 South Adelaide's Reserves opened their season with a 40-point loss to West Adelaide at City Mazda Stadium. As has been the case throughout the preseason and trial games, the Panthers fielded a young side, with 10 players playing their first senior game for the club - Alexander Aurrichio, Matt Raitt, Nick Steele, Coby Helyar, Kaj Patterson, Tom Neville, Thomas Drew, Jesse McKinnon, Joseph Tyllis, Jesse Fitzgerald and Ben Allevi. Turnovers proved costly throughout the match, with West Adelaide punishing several skill and decision making errors. Reserves Head Coach, Adam Blakely highlighted a need for his team to remain consistent with their structural set ups to allow for cleaner ball movement and the ability to defend turnovers on a more consistent basis. When the Panthers did move the ball well they were able to score on a consistent basis. Work will be done before the next game to ensure the team can do this more often. Alex "Regg" Moyle was best afield for South Adelaide, finishing with 26 disposal and a goal through the middle of the ground. Also impressive were Cody Szust (17 touches), Matt Raitt (15 and goal) and Jesse McKinnon (13).